Luboml is a market town about 200 miles southeast of Warsaw, Poland. It is a border town whose history dates back to the 11th century. Along with Chelm and Belz, it was part of the Eastern European region known as Volhynia - bordered by Lithuania on the north, Russia to the east, and Poland to the west. Luboml lies in an ambiguous area of changing borders and has belonged in succession to Russia, Poland, Lithuania, Poland, Russia and Poland (again!). 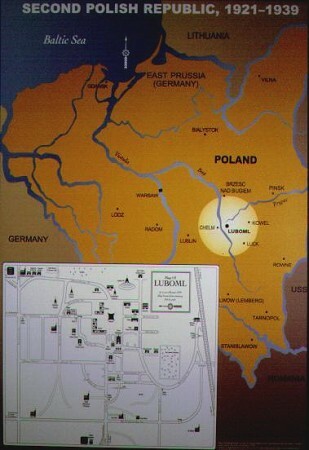 In 1939, the Germans occupied Luboml. The region was turned over to Soviet control until 1941, when the Germans reoccupied Luboml. The story of Luboml is like the story of many East European Jewish communities. In 1940, Luboml was a prosperous shtetl (market town) with a population of more than 5,000 of whom more than 90 percent were Jewish. The major architectural presence in Luboml was the Great Synagogue, built in the 17th century. Above the doorway of the fortress-like four-story structure, with its Moorish battlements, was the passage from Numbers 23.5, "How goodly are thy tents, O Jacob." Luboml was not a conspicuous place. It didn't have an important river, and no one famous came from there. But it was not like the quaint rural village portrayed in "Fiddler on the Roof". Luboml was an important regional market town with electric lights, numerous trades and businesses, factories and workshops. Its active civic, religious and cultural life included a theater, a cinema, sports teams, and organizations for community welfare. Many in the Jewish community were deeply involved in Zionist organizations, from the far left to the far right. The Betar movement (forerunner of the Likud Party in Israel) was one of the dominant factions. Menachem Begin, head of Betar in the 1930s and later Prime Minister of Israel, visited in 1934. As anti-Semitism and the Nazi threat grew in the 1930's, Lubomlers able to leave began to emigrate. Some went to Palestine, others to the United States. On October 1, 1942 the Germans, who controlled the town, with the aid of Ukrainian police units rounded up the remaining Jewish inhabitants of Luboml and marched them into the countryside. There the Jews were lined up in front of open pits and shot. By the time the Soviet Red Army liberated Luboml in 1945, only 51 Jews from Luboml (excluding those who had emigrated before 1939) survived the Holocaust. More than 1,000 died in the mass execution on October 1, 1942. The German liquidation of the town effectively ended a six-century history and presence of Jewish life in Luboml. Today Luboml is a part of the Republic of the Ukraine. But there are no longer any Jews in the town.